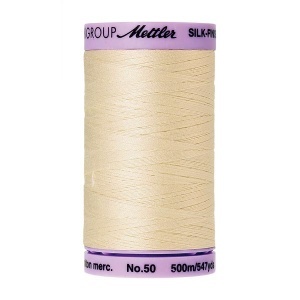 Mettler silk-finish Cotton 50 thread is 100% mercerized cotton long staple thread, 50/2 ply. This thread is ideal for piecing and general sewing of dress weight cottons and can be used for machine or hand sewing. Pale grey in colour, 500m (547yd) length reel (old colour reference 0813). 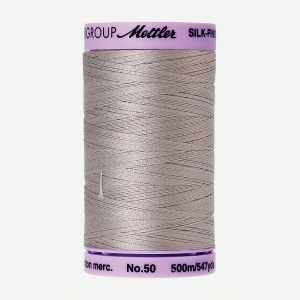 Mettler Silk Finish Cotton 50 sewing thread is strong and break resistant, and gives off very little fluff in the sewing machine. It is also colour safe and shrink resistant, as well as fade resistant and safe to iron. Mettler Silk Finish thread is perfect for sewing dress weight fabrics, and therefore is the ideal thread for patchwork piecing. It can also be used for machine quilting where a lighter weight cotton is required for a less prominent stitch effect. These 500m reels are perfect for larger projects. Mettler have recently re-branded all their thread products, so many of the colour shades have new numeric references. Where this applies, the old reference number is noted in the description - the only difference between the old and new threads is the name! 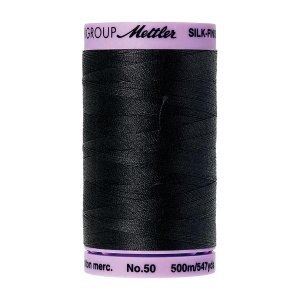 Please click on a Mettler Silk Finish Cotton 50 sewing thread for more details.